The Checkpoint Learning Tax Research Certificate Program™ helps candidates develop foundational tax research knowledge while earning approximately 20 hours of Continuing Professional Education credit. This program was designed for CPAs or future CPAs, Tax Accountants, Senior Tax Accountants, Tax Managers, or anyone wanting to improve their tax research skills or become more efficient. Tax research proficiency is all too often underserved in formal education programs, leaving new accountants missing key skills required to perform effectively. From dependence on unreliable internet sources, to lack of clarity on the import (and order) of law, case law, commentary and treatises, many tax leaders find their staff unprepared to perform real-world tax research. Professionals may register for a free 30-day trial subscription of Checkpoint to aid in course completion. Candidates who successfully complete the course work and final exam will earn a Checkpoint Learning Tax Research Competency Certificate™. The certificate gained will reflect a thorough and transferable foundation in tax research. 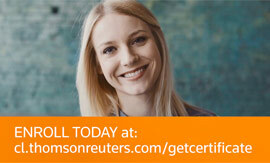 The courses include examples from Thomson Reuters Checkpoint®, the profession's leading source for intelligent tax and accounting information. Or, to purchase multiple seats for your team or firm, please call us at 800.231.1860. Discounts are available for the purchase of 3 or more seats or for the purchase of 10 seats. The full program is comprised of three interactive online courses and three online video courses that cover both federal and state tax research topics plus a comprehensive web-based final exam to test understanding of core concepts. Candidates in need of continuing education will be able to earn approximately 20 CPE credits. The program includes a comprehensive, web-based multiple-choice final exam to test understanding of core concepts. Note, each individual course concludes with an exam for CPE credit. The Tax Research Certificate Program provides learners with the opportunity to earn up to 20 Continuing Education credits. The program can be completed in as little as one week or at your own speed for up to one year. Those who successfully complete the program will earn a Checkpoint Learning Tax Research Competency Certificate. Certificate holders can add this accomplishment to their resume or LinkedIn® profile. If you have additional questions on this certificate program, please call us at 800.231.1860. Tax Research: Tax Law and Treasury Interpretations. This course provides an introduction to the area of tax research. It will reacquaint you with the Internal Revenue Code and Treasury Department regulations as well as interpretations, rulings, and procedures issued by the Internal Revenue Service. It will teach you how to research tax issues and answer tax questions by consulting these tax materials. Tax Research: Court Interpretations and Citator. The second course in our series on tax research further hones your tax research skills, discusses judicial interpretations and citations from various U.S. courts, and introduces the Citator research tools. NOTE: To complete this course, you must have access to at least one tax service [e.g., Thomson Reuters Checkpoint, CCH Incorporated, or Shepard's (part of LEXIS Publishing)]. Tax Research: Case Analysis. This online course further develops the knowledge and tax research skills acquired in the previous two courses of this series. Each chapter has a taxpayer scenario that presents a few facts and requests an opinion or recommendation on the handling of a particular tax matter; the learner will realize the relationship of the law, interpretations, and cases to the taxpayer. Note: To complete this course, you must have access to at least one tax service. Cracking the Code: Efficient and Thorough Tax Research Techniques. In today’s value-driven tax planning environment, tax accountants must research accurately, thoroughly and efficiently. This is especially difficult for researchers who have grown up using Google to answer every question, as keyword searching without a frame of reference (or knowledge of the right keywords) is often the least efficient and effective way to answer tax research questions. This video course will teach a systematic research methodology that tax researchers may use in order to identify and analyze tax issues efficiently, accurately and thoroughly. Among other topics, it will teach students the hierarchy and different types of primary sources in tax law and discuss how to use secondary sources most effectively. Students will have opportunities to practice their skills on realistic research exercises, using RIA Checkpoint to answer research problems. Cracking the Code: Advanced Tax Research. This video course builds on the basic skills taught in Cracking the Code: Efficient and Thorough Tax Research Techniques for participants to learn advanced research skills such as code section based research, state tax research, using explanations and annotations to find the most relevant authorities, and when and how to use keyword searches. Participants will also learn when and how to use legislative history in their tax research, and will practice their research skills with research examples. Checkpoint Functionality: Getting Started with the Basics. The material covered in this video course gives you the groundwork needed to use Checkpoint for your research. Basic functionality is the same in all practice areas, so whether you are researching international, federal or state tax issues, accounting, pension, estate, or payroll, what you learn here will apply to all! This course shows you how to keyword search, efficiently navigate in the system, and how to set yourself up to receive newsletters by email so you can stay up-to-date on the latest happenings in your field.